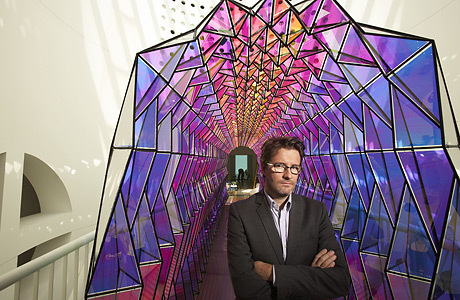 Olafur Eliasson photographed in front of his One Way Colour Tunnel at the San Francisco Museum of Modern Art, September, 2007. The artist who wowed everybody four years ago with The Weather Project at Tate Modern in London turns out to have more than one trick up his sleeve. Using elements as simple as light, mist and mirrors, Eliasson plays very skillfully on our willingness to submit to illusions even when we know that's what they are.